I've been a bad blogger lately, and for that I apologize to my readers--both of you. Chalk it up to a combination of business travel, deadlines, a torn rotator cuff, which until it is repaired next year motivates me to stay away from keyboards as much as possible, and pure laziness. Add to that the desire to take advantage of whatever daylight hours are available to do fall cleanup on the garden, frustration with blogger (some of my best material is out there in the ether), and. . .enough with the excuses. Speaking of things thought to be dead, I've been moving a lot of shrubs and perennials around this fall. Apparently conditions are favorable enough in my planting beds that some plants quickly exceed even the upper bounds described in the planting guides. Or perhaps I just couldn't imagine that a plant in a 2" pot could so quickly reach a 36" diameter. 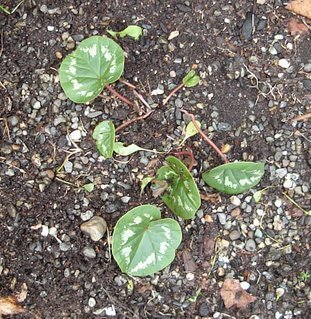 Also, I don't have great design sense, so it doesn't occur to me when I'm setting out plants that perhaps they aren't all that appealing en masse, and would look better scattered throughout the beds. So I move things around until I find an arrangement that suits me. 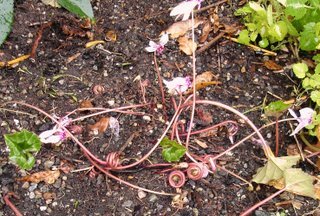 What made all this shuffling around exciting was discovering lost plants--those perennials that were overwhelmed by their more vigorous neighbors. Like me this last month, they weren't dead, just buried. From the looks of the curled stems, it's been blooming away under cover without my ever getting to appreciate it. 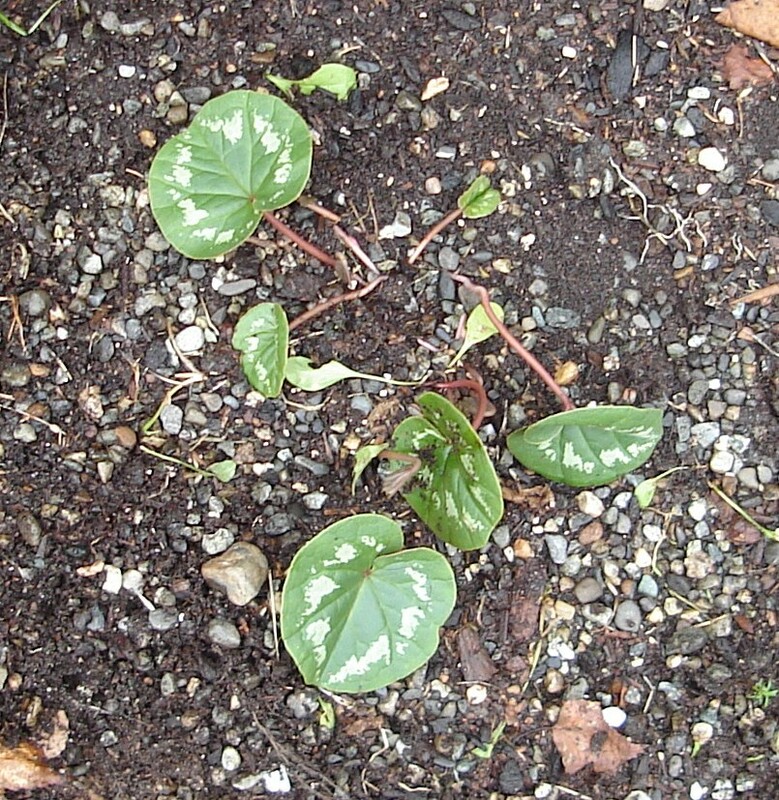 And the tiny cyclamen coum that I thought the chickens had scratched out when I found the plastic marker (yes, I keep the plastic markers next to my small perennials until they get well enough established for me to remember where they are, so sue me!) lying in the middle of a dustbath spot some 6 feet away from where I had actually planted it, it turns out. I should know better than to plant miniature things, as my experience with several very expensive miniature hostas should teach me, but I love the way these stand up to the coldest weather and bloom even earlier than the snowdrops some years. 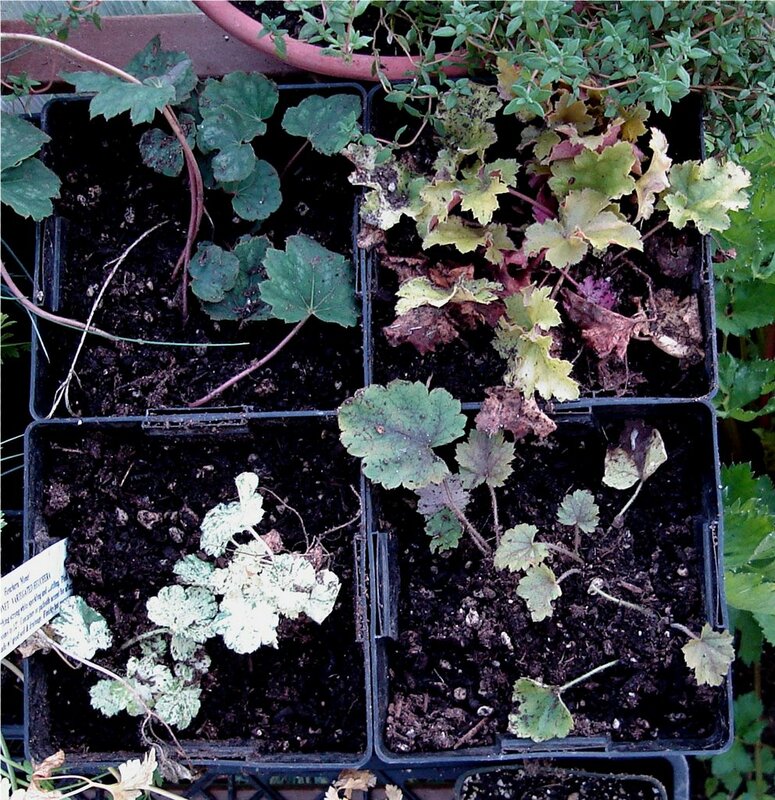 Now how does one lose a heuchera? I have others that run rampant, I divide them, give divisions to friends, who give divisions to their friends. These were fine full plants, overflowing their 6" pots. I've relocated them to similar pots and am wintering them over in my greenhouse in the hope that they will regain some of their former glory. Especially 'Monet', in the lower left-hand corner. The prettiest little green and white heuchera I've ever seen. It appears that the key to getting into blogger and successfully uploading pictures is to do it early on Saturday morning when the rest of the denizens of the blogosphere are still asleep. Point taken. See you next week.